I seem to have returned to an old obsession. Tying to understand the underlying causes and timings of ice ages is as frustrating as it is fascinating. 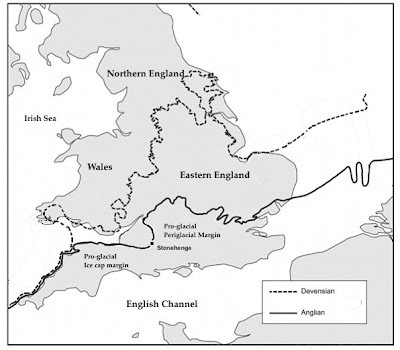 By far the largest glaciation that occurred over Britain was 480,000 years ago in what geologists call the ‘Anglian’ ice age. Two thirds of Britain and Ireland were then covered by a thick ice sheet extending from the west coast of Ireland across the North Seas all the way to Norway. The British Ice sheet reached as far south as Oxfordshire and Essex diverting the original course of the River Thames, which flowed north to the Wash, to its current position through what is now London. Geological evidence for this can be seen in old destroyed river beds and layers of boulder clay laid down by glaciers. The second largest glaciation was the most recent one which reached its maximum extent at LGM 25,000 years ago. It is called by geologists the ‘Devensian’ . It turns out that these two glacial cycles were very similar, despite being spaced by 400,000 years, because of a regular cycle in the earth’s eccentricity. When eccentricity is low glaciations are always longer and deeper. 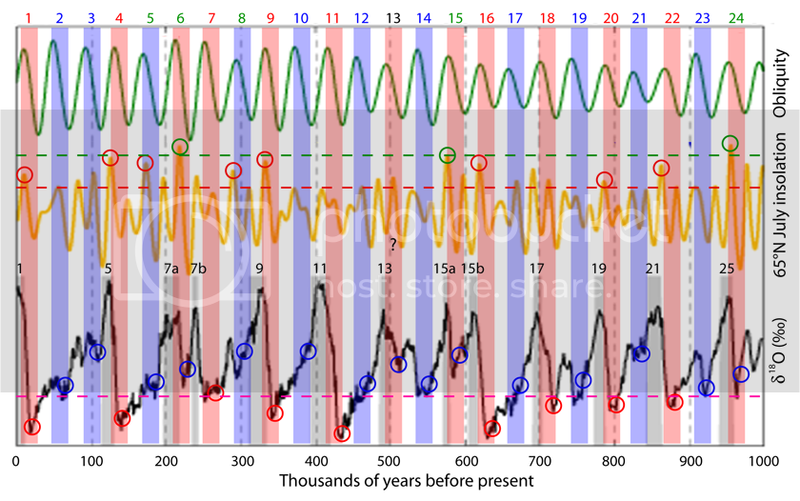 To see how this happens, we can start by comparing the last 800,000 years of ice-core data as shown below. The ‘Anglian’ ice volume, as measurement by Benthic Fora dO18, exceeded that of the LGM, and proves that this was also a global phenomena. The Anglian interglacial also lasted far longer than normal, at least 25,000 years, and this is most likely because of the weak value of eccentricity. A very similar situation is re-occurring now, luckily for us, because an even lower eccentricity peak will occur in 30,000 years time. Low eccentricity mainly acts to suppress the effects of precession, leaving just the 41000 year obliquity cycle to cause seasonal changes at the poles. 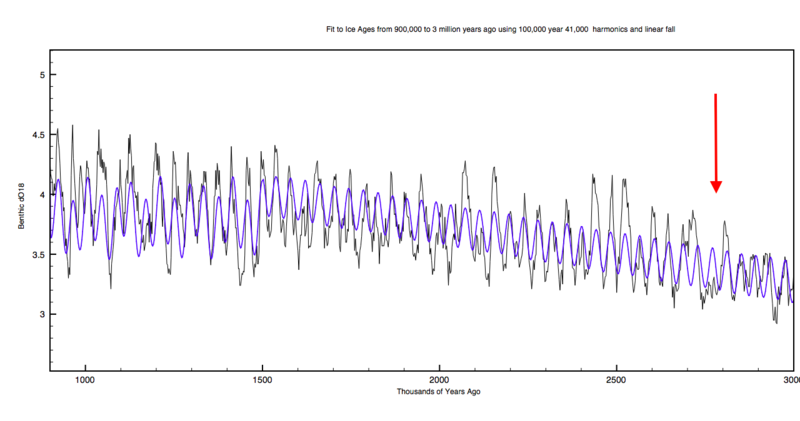 For reasons that are not yet fully clear, this alone has not been sufficient to end ice ages for a million years. From 5 million to 1 million years ago glaciations followed the 41,000 year obliquity cycle, but as the earth cooled and glaciations became more extensive this then switched to a 100k year cycle. No-one has yet convincingly explained quite why this occurred. The reference calculations of Laskar et al. which solve the solar system multi-body gravitational orbital equations also show a remarkable 2.8 million year cycle in eccentricity. I have never seen this mentioned before. We are entering a periodicity very similar to that which occurred just under 3 million years ago. LA2010 calculations of the earth’s eccentricity over a 4 million year period spanning the present day. So what happened 2.8 million years ago? 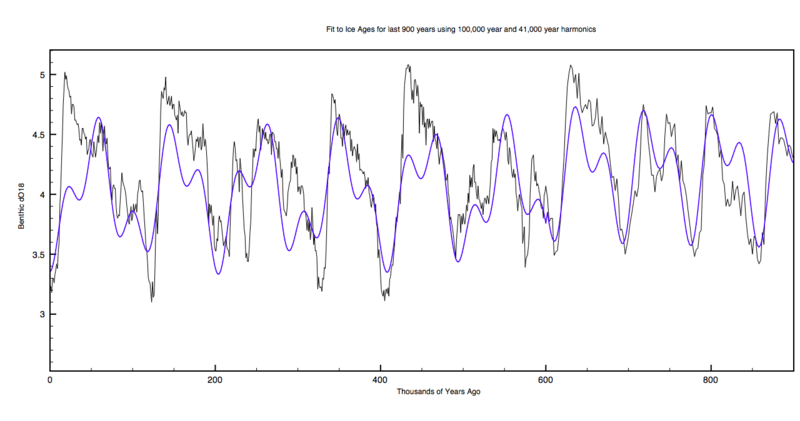 The climate was much warmer then and the glacial cycle was driven by the 41ky obliquity cycle. Yet at that exact time two successive glaciations missed a beat doubling the glacial cycle to 82,000 y. Combined fits compared to data 900-1500 ya (see Phenomenology of Ice Ages) The red arrow marks a low eccentricity cycle exactly similar to the current one. Two successive glaciations lasted about twice the obliquity period ~80,000 y although the earth was much warmer and levels of CO2 higher. 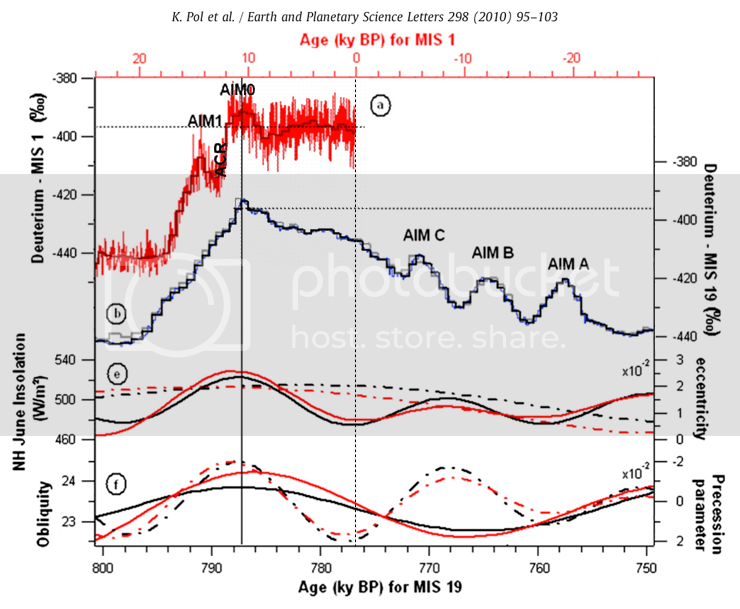 Further evidence that eccentricity over the last million years subtly modulates all glaciations can be seen by comparing the net annual average insolation the earth receives from the sun. Despite Keppler’s law there is still a small variation in the net solar insolation that the earth receives, dependent on eccentricity and slightly modulated by obliquity. The values shown below are all calculated using the Laskar’s 2010 orbital solution model. The change in net solar forcing change is very small ( <0.5 W/m2) and unlikely to be as important as changes in how the radiation is distribution, but it is rarely mentioned. When eccentricity is low glaciations become more severe, more sawtoothed and yet somehow still end with a bang. How do they end? Is this perhaps when Gaia intervenes to restore a climate that is more conducive to life on earth? This entry was posted in Climate Change, Ice Ages and tagged Ice Ages. Bookmark the permalink. I am not convinced about the supposed important role of precession in glacial cycles. No doubt it contributes, but the sample is small and conflicting. The Anglian interglacial, or MIS 11 is only similar to the Holocene (MIS 1) in eccentricity. Precession (65°N summer) and obliquity cannot be both aligned simultaneously between MIS 11 and MIS1. During MIS 1 both precession and obliquity peaked at ~11 and ~10 Ky BP, while during MIS 11 obliquity peaked at ~416 Ky BP, while precession peaked at ~408 Ky BP. This suggests that the Anglian interglacial could have been longer because the appropriate shift of both peaks created the equivalent of a broad peak. The 400 Ky eccentricity cycle has another analog at ~800 Ky BP, MIS 19. This interglacial is the closest astronomical analog of the Holocene during the past million years. The position of the precession and obliquity peaks is very similar. 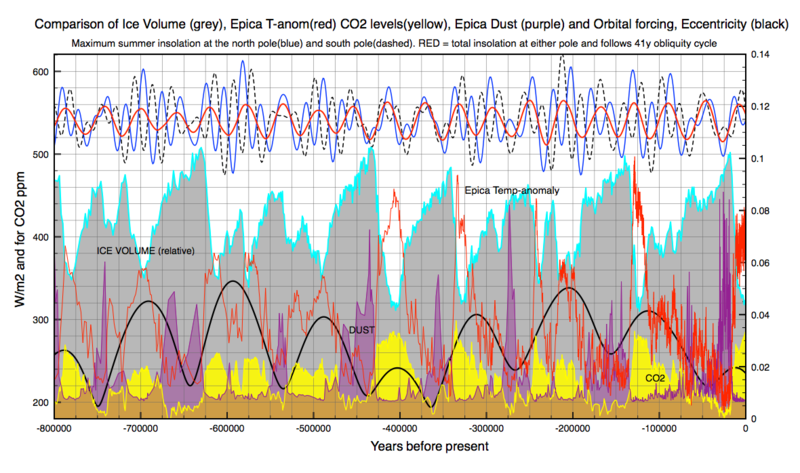 Regretfully for your theory, this was a short interglacial despite low eccentricity. I just think that MIS 11 is the wrong example for current interglacial. Except that MIS19 lies exactly at the transition between the 41k world and the 100k world so the earth had not yet cooled enough for deep glaciations. It certainly looks more like a double wavelength obliquity cycle. In fact it is almost the first cycle that extended the 41k metronome. There is no transition from a 41k world to a 100k world. It is all in our minds. A way of categorizing what in reality is a continuous process of cooling. As the planet cooled, the obliquity cycle had increasing problems to warm the planet enough to get out of glacial conditions. It then required the help from the precession cycle, that by itself produces almost no signature in the temperature record. But when the precession cycle fell at the right time window, the obliquity cycle produced an interglacial, and when it didn’t glacial conditions prevailed. 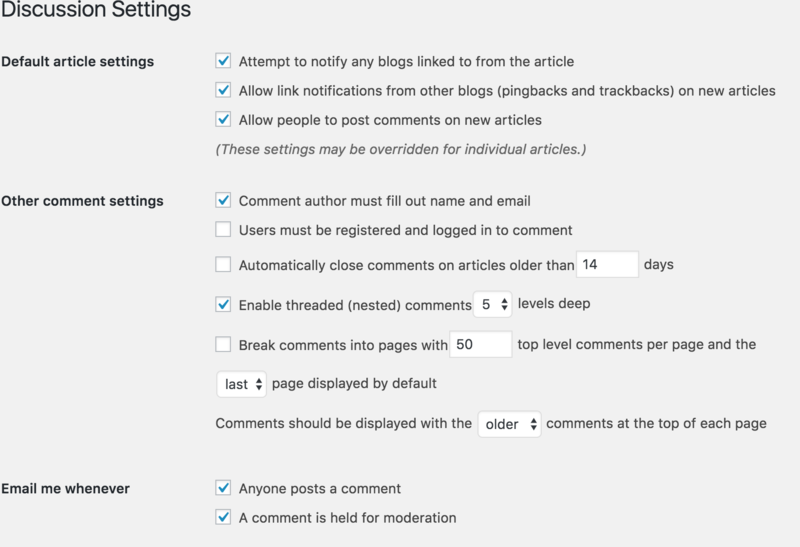 I hope the ‘Post Comment’ disappearing button problem is now solved. It seems to be a Jetpack funny. What was the solution please clive, I seem to have similar problem on my blog. So the 100k periodicity is an artefact. It does not exist. It is the product of the interference of the 41K obliquity and the 19, 22 and 24K precession cycles. In fact we get double peaks like MIS 7 and MIS 15 where we get to choose which one is an interglacial and which one is not because otherwise we have interglacials separated by 41K, 200 and 600 thousand years ago. Also MIS 19 takes place when the Earth has already reached its bottom average temperature. For the last 800 kyr the Earth is no longer reducing its average temperature, but the oscillations have increased in amplitude. It then required the help from the precession cycle, that by itself produces almost no signature in the temperature record. But when the precession cycle fell at the right time window, the obliquity cycle produced an interglacial, and when it didn’t glacial conditions prevailed. I agree with your scenario roughly 80%. However what exactly is the right time window for precession? Many NH precession maxima had little effect on the ice sheets, while others succeeded. Eccentricity clearly does play the crucial role in determining the strength of the precession term, since if eccentricity = 0 then precession = 0. The only metronome throughout the last 5 million years is obliquity. This uniquely changes summer insolation for both poles symmetrically if eccentricity = 0, and determines the location of climate zones on earth. Precession and Obliquity alone can’t explain ‘ice ages’. The combination-graphic is above quite enlightening and I reference it regularly. No single periodicity explains the irregular periodicity of glaciation and perhaps it’s more psychology that we would look for such regular periodicity than climatology. Glaciations appear slower and more irregular. De-glaciations appear rapid ( so rapid that not much variation appears ). A critical intensity and duration of melt season at high latitudes can come from different combinations of orbital variation – not surprising. There should be some greater association with the lowest frequency periodicity because of stochastic resonance – one summer’s melt season can be more intense than average and one century’s melt seasons similarly, so a slow period allows a greater chance of de-glaciation and the corresponding feedbacks to begin just from natural variation on top of a forcing regime. But overall, melt season insolation appears to describe the glacials, regardless of how the orbital fluctuations combine to determine seasonal sunshine. One aspect to distinguish is that glacials are largely the result of variations of melt season only net radiance at the bottom of the atmosphere in the high Northern latitudes while the forcing from antrhopogenic GHGs is global average year round net radiance at the top of the atmosphere. Many assume glacials/inter-glacials the result of change in global average temperature as an analog to 2xCO2. But that appears incorrect to me. It appears that it’s more apt to say ice ages caused global average cooling than global average cooling caused ice ages. I am looking at radiance of 2xCO2 in comparison and contrast with glaical cycle variations and promise to burden you with a link here when I’m done. 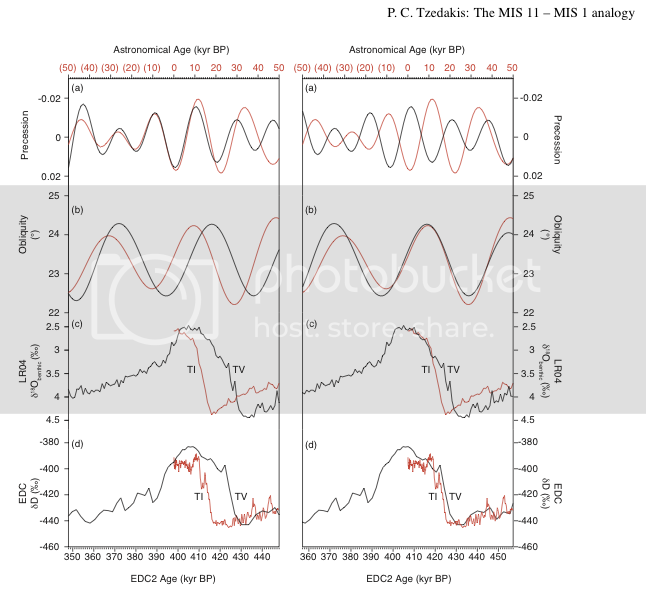 Tamino has also a very good series of articles on glacial cycles and he also happens to defend Huybers theory that glacial cycles are controlled by obliquity and there is no 100k cycle. Obliquity window is defined by raising obliquity. Interglacial (IG) is favored by high insolation (above red dashed line) in the second half of the window. The second factor is very low temperatures (below purple dashed line) in the first half of the window, a factor defined by D. Paillard (1998) probably related to ice melting dynamics as a strong positive feedback. Both factors are marked with red (or green) circles. Glacial is favored by minimum temperatures above the purple dashed line (blue circles). Obliquity cycles with only promoting conditions always produce IGs (red numbers). Cycles with both red and blue circles produce IG only if insolation is very high (green numbers). Cycles with only inhibiting conditions never produce IGs (blue numbers). MIS 13 is the exception, a strange coldest IG with a spike. The two repeats (MIS 7 & 15) show the strongest insolation (green circles). There are 13 IGs in 1 million years (77 Kyr average). The fake 100 K periodicity is highly favored by the presence of the two repeats (MIS 7 & 15). 1-5 (123k), 5-7b, 7a-9, 13-15b, 15a-17, and 21-25, due to the slight displacement of 21. The real question is why something so obvious is missed by so many experts in the field. Probably the same is happening with CO2, it is obvious that CO2 is not the main driver of Earth’s climate, yet a lot of experts think so. Your results are interesting and show a definite pattern but they still don’t ‘explain’ the physics. To do that we would need to build an ice growth/melt model which responds to enhanced insolation only when there are very low temperatures and maximum ice extent. What you don’t show is that 17a/b and 15 a/b also coincided with largest orbital eccentricity in the 400,000 y cycle. The longest glacial cycles like the last one occur at small eccentricity. The reason is that eccentricity modulates precession. This was unimportant earlier than 1 million years ago, since obliquity alone melted back the northern ice sheets. Otherwise I agree with you. CO2 is a bystander and its only effect is to enhance slightly both warming and cooling caused by Milankovitch cycles. Yes, I agree. Eccentricity by itself is too small a forcing to affect glacial cycles, but when eccentricity is high it enhances the effect of precession enough to sometimes turn what should be glacial conditions into an interglacial. This means that when eccentricity is low, like now, it not only reduces its small forcing, but it reduces the effect of precession too, so my hypothesis is that precession during eccentricity 400k lows is too small to help obliquity produce an interglacial without the strong positive feedback factor or to sustain inerglacial conditions once obliquity gets low enough. This interglacial should come to an end in a few thousand years, and the next one should not come for about 70 thousand years. Regarding glacial termination what the evidence points is that a strong positive feedback is required to melt enough ice before the increasing obliquity window closes. As the planet cooled, ice sheets expanded South and obliquity has a problem because its forcing is only strong at high latitudes. Precession works also at mid-high latitudes, enhancing ice melting there, at the borders of the ice sheets. The strong feedback from low temperatures I think it has to do with low sea levels. When sea levels are >100 m lower, a lot of ice from ice sheets and glaciers occupy areas below current sea levels. When obliquity starts to melt ice and sea levels start rising, the water is many times more efficient at melting ice than the atmosphere or the Sun, and works at melting ice 24 h/day and all seasons even if just a few degrees above freezing. By the time obliquity peaks most of the ice is already gone, sea levels are near current levels and the interglacial can start. During failed interglacials when sea levels stop rising they are way below current levels which means there is still a lot of ice in the ice sheets so the rise in temperatures stalls. As I predicted in 2011, the “pause” will continue until at least 2027 and 500 years of cooling lies ahead starting later this century. Dr Spencer’s March 2016 temperature data is now available. Note that the red line (the annual moving average that eliminates seasonal effects) is still not as high as the maximum in 1998 and the El Nino spike is past its maximum. Click the link below to see details. Don’t be misled by the data from ground based weather stations. Those that have not warmed get eliminated, whilst those that have not been affected by urban crawl warming have their rate of warming adjusted upwards. It is all FRAUDULENT science. Trust only Dr Spencer’s satellite data. Reducing carbon dioxide will not help the environment because it cools rather than warms and it enhances agricultural production and growth of everything from flowers to forests. There is no valid science supporting the radiative forcing greenhouse garbage for the gullible. Hence, for the natural thermodynamic process that is a one-way pencil of radiation from a cooler system (a region of the atmosphere) to a warmer system (a region of the surface) there can be no decrease in entropy, and hence no heat transfer. This Second Law applies to every independent process, so a reduction in entropy cannot be excused by a subsequent larger increase in entropy. For example, water cannot flow up a mountain to a lake at the top (reducing entropy) just because it will subsequently flow down further (increase entropy more) on the other side. Net effects of two or more non-dependent processes do not excuse a violation of the law. Hence GH radiative forcing is FALSE. For more detail see http://climate-change-theory.com .